Trifecta Nutrition is a meal delivery service that offers USDA certified organic meals delivered fresh to your doorstep. The meals arrive vacuum sealed, unlike most delivery services that have food in frozen on plastic containers. You can pick a certain meal plan type such as Paleo, “Clean,” vegetarian or vegan or pick a la carte options. The A La Carte offerings include tuna steak, salmon, bison—not your typical chicken and beef order from other delivery services. 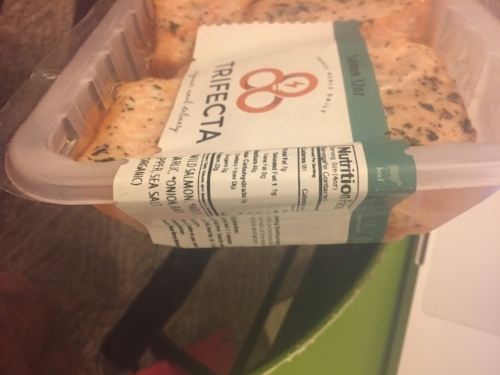 We tried Trifecta Nutrition’s meals and overall, the food tasted great and wasn’t overly seasoned. Here are the main ingredients and macronutrients for two sample meals and the A La Carte Salmon and Steak. Ingredients: Wild Salmon, parsley, garlic, onion, black pepper, sea salt. Ingredients: Wild Salmon, onion, red pepper, spinach, asparagus, yellow squash, garlic, basil, turmeric, coriander and more. Ingredients: Cage free chicken breast, vegetable mix including onion, carrots, tomatoes, and green peppers. Ingredients: Grass fed beef, parsley, garlic, onion and more spices. The two meals above contained 36 and 38 grams of protein, not bad for under 500 calories per meal. The steak is protein heavy with 48 grams per 8oz and the salmon has 44 grams of protein per 8 oz. The theme with these meals is that there is a protein choice for you, whether it’s cod, turkey, quinoa, venison, elk, shrimp or any other source one can imagine. Most importantly, every meal is non-GMO, ensuring you’re eating clean, real food. The Premium Version of the Trifecta App (available in the Apple Store) is $49.99 per year billed annually or $9.99 per month. The premium version comes with 70+ HD workout videos that demonstrate various exercises, members only articles, a members only Live Q&A with CrossFit Athlete Brooke Ence (who also stars in DC Comic’s Justice League), and you get access to a members only Trifecta Facebook Group. Plus, you get the ability to track macronutrients by meal and get more in depth nutrition tracking compared to the free version. Last, the premium version is ad-free. The free version of the Trifecta App includes daily workouts written in text, daily calorie tracking, access to video series and more. The Trifecta Nutrition app is like MyFitnessPal for CrossFitters and weightlifters, complete with WODs available for free. It would be nice to a pre-populated list of Trifecta meals in the app so you can just add the meals your daily nutrition tracking without having to add the macros manually. Trifecta is an official sponsor of Ultimate Fighting Championship (UFC) and is partnered with Cody “No Love” Garbrant and Paige VanZant. UFC fighters are some of the most elite athletes in the world having them on board with Trifecta says a lot. Overall, I think having such a vast A La Carte menu is a plus for Trifecta, since athletes often just want a bunch of one thing to cook for themselves. The meal plans assure athletes that they’re getting healthy, clean meals whereas some meal companies sneak in a few “mock junk food” meals like pizza and burgers.